While leaders chase desperate measures to squeeze the country and surrounding regions for every drop of water supply they can, “sensible and eminently doable” reforms in pricing and water conservation remain unexplored. Gob-smacking engineering projects aimed at quenching the country’s thirst—such as the Yangtze-transforming Three Gorges mega-dam and the even more monumental South-North Water Diversion Project (currently in the throes of construction)—also give rise to an array of new problems, instability and ever more dry-up. Northern China is running out of water, but the government’s remedies are potentially disastrous. He was not exaggerating. A stock image of China is a fisherman and his cormorant on a placid lake. The reality is different. The country uses 600 billion cubic metres (21,200 billion cubic feet) of water a year, or about 400 cubic metres a person—one-quarter of what the average American uses and less than half the international definition of water stress. The national average hides an even more alarming regional disparity. Four-fifths of China’s water is in the south, notably the Yangzi river basin. Half the people and two-thirds of the farmland are in the north, including the Yellow River basin. Beijing has the sort of water scarcity usually associated with Saudi Arabia: just 100 cubic metres per person a year. The water table under the capital has dropped by 300 metres (nearly 1,000 feet) since the 1970s. China is using up water at an unsustainable rate. Thanks to overuse, rivers simply disappear. The number of rivers with significant catchment areas has fallen from more than 50,000 in the 1950s to 23,000 now. As if that were not bad enough, China is polluting what little water it has left. The Yellow River is often called the cradle of Chinese civilisation. In 2007 the Yellow River Conservancy Commission, a government agency, surveyed 13,000 kilometres (8,000 miles) of the river and its tributaries and concluded that a third of the water is unfit even for agriculture. Four thousand petrochemical plants are built on its banks. The water available for use is thus atrocious. Song Lanhe, chief engineer for urban water-quality monitoring at the housing ministry, says only half the water sources in cities are safe to drink. More than half the groundwater in the north China plain, according to the land ministry, cannot be used for industry, while seven-tenths is unfit for human contact, ie, even for washing. In late 2012 the Chinese media claimed that 300 corpses were found floating in the Yellow River near Lanzhou, the latest of roughly 10,000 victims—most of them (according to the local police) suicides—whose bodies have been washing downstream since the 1960s. In 2009 the World Bank put the overall cost of China’s water crisis at 2.3% of GDP, mostly reflecting damage to health. Water shortages also imperil plans to expand energy production, threatening economic growth. China is hoping to follow America into a shale-gas revolution. But each shale-gas well needs 15,000 tonnes of water a year to run. China is also planning to build around 450 new coal-fired power stations, burning 1.2 billion tonnes of coal a year. The stations have to be cooled by water and the coal has to be washed. The grand total is 9 billion tonnes of water. China does not have that much available. According to the World Resources Institute, a think-tank in Washington, DC, half the new coal-fired plants are to be built in areas of high or extremely high water stress. The best answer would be to improve the efficiency with which water is used. Only about 40% of water used in industry is recycled, half as much as in Europe. The rest is dumped in rivers and lakes. Wang Zhansheng of Tsinghua University argues that China is neglecting its urban water infrastructure (sewerage, pipes and water-treatment plants), leading to more waste. Water prices in most cities are only about a tenth of the level in big European cities, yet the government is reluctant to raise them, for fear of a popular backlash. The result is that China’s “water productivity” is low. For each cubic metre of water used, China gets $8-worth of output. The average for European countries is $58 per cubic metre. Of course, these countries are richer—but they are not seven times richer. Rather than making sensible and eminently doable reforms in pricing and water conservation, China is focusing on increasing supplies. For decades the country has been ruled by engineers, many of them hydraulic engineers (including the previous president, Hu Jintao). Partly as a result, Communist leaders have reacted to water problems by building engineering projects on a mind-boggling scale. The best known such project is the Three Gorges dam on the Yangzi. But this year an even vaster project is due to start. Called the South-North Water Diversion Project, it will link the Yangzi with the Yellow River, taking water from the humid south to the parched north. When finished, 3,000km of tunnels and canals will have been drilled through mountains, across plains and under rivers. Its hydrologic and environmental consequences could be enormously harmful. 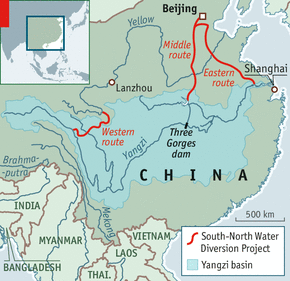 The project links China’s two great rivers through three new channels. The eastern, or downstream one is due to open by the end of this year (see map). It would pump 14.8 billion cubic metres along 1,160km of canals, using in part a 1,500-year-old waterway, the Grand Canal. The water pumped so far has been so polluted that a third of the cost has gone on water treatment. A midstream link, with 1,300km of new canals, is supposed to open by October 2014. That is also when work on the most ambitious and controversial link, the upstream one across the fragile Himalayan plateau, is due to begin. Eventually the South-North project is intended to deliver 45 billion cubic metres of water a year and to cost a total of 486 billion yuan ($79.4 billion). It would be cheaper to desalinate the equivalent amount of seawater. The environmental damage could be immense. The Yangzi river is already seriously polluted. Chen Jiyu of the Chinese Academy of Engineering told South Weekly, a magazine, in 2012 that the project so far has reduced the quantity of plankton in the Yangzi by over two-thirds and the number of benthic organisms (those living on the river bottom) by half. And that was before it even opened. Ma Jun, China’s best known environmental activist, says the government’s predilection for giant engineering projects only makes matters worse, “causing us to hit the limits of our water resources”. But the biggest damage could be political. Proposed dams on the upper reaches of the Brahmaputra, Mekong and other rivers are bound to have an impact on downstream countries, including India, Bangladesh and Vietnam. The Chinese say they would take only 1% of the run-off from the giant Brahmaputra. But if all these projects were operational—and the engineering challenges of one or two of them are so daunting that even the Chinese might balk at them—they would affect the flow of rivers on which a billion people depend. Hence the worries for regional stability. And all this would increase China’s water supplies by a mere 7%. The water crisis is driving China to desperate but ultimately unhelpful measures.